BEIJING - China's economy expanded by 9.2 percent in 2011 from a year earlier and 8.9 percent year-on-year in the fourth quarter, the National Bureau of Statistics (NBS) said Tuesday. The quarterly growth was the slowest in 10 quarters. 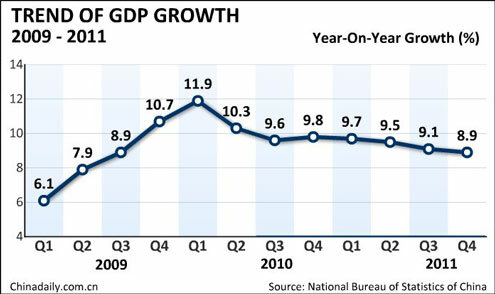 China set its full-year growth target at 8 percent in early 2011 after its economy grew 10.4 percent in 2010. The country's economy expanded 2 percent in the fourth quarter on a quarterly basis, NBS chief Ma Jiantang said at a press conference. The economy grew 9.1 percent year-on-year in the third quarter of 2011, compared to 9.5 percent in the second quarter and 9.7 percent in the first quarter. According to preliminary statistics, the country's GDP reached 47.16 trillion yuan ($7.26 trillion) in 2011, Ma said. He said the country's economic performance in 2011 was "a good start" for the 12th Five-Year Plan (2011-2015) period and is in line with macroeconomic regulations. For investors, the figures can also be interpreted as good news. Boosted by the data, China's stocks surged 4.18 percent on Tuesday's close, the most since September 3, 2009. "We should no longer be obsessed with the speed of growth," said Lu Zhongyuan, deputy director of the Development Research Center of the State Council, or China's cabinet. He predicted the expansion of China's GDP will decelerate to around 8.5 percent in 2012. A report released Tuesday by the Center for Forecasting Science under the Chinese Academy of Sciences also predicted growth of 8.5 percent for this year. The NBS chief said the country faces a highly complicated external environment in 2012, as the economies of the European Union and the United States remain sluggish, the global financial market is experiencing turbulence and protectionism is on the rise. There are also a number of domestic risks, including mid- and long-term upward price pressures and funding shortages for small businesses, as well as structural changes intended to enhance energy-saving and emission reduction, he added. "Although GDP growth fell on a quarterly basis, it was within a reasonable range and the country's economic fundamentals were not changed. We have confidence for 2012's growth," said Ma. He said the country's urbanization process, the development of its market economy and industrialization have provided exhaustive forces for growth. The number of people living in China's cities for the first time exceeded those living in the country's rural areas as of the end of 2011, according to the NBS. NBS data also showed that China's industrial value-added output growth decelerated in 2011 from a year earlier to 13.9 percent year-on-year. 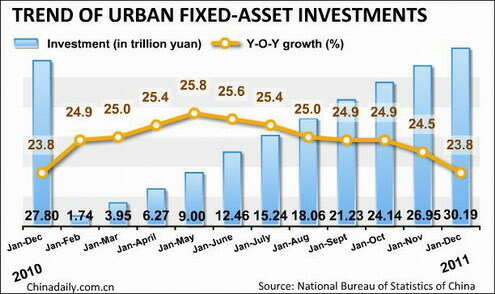 The country's fixed-asset investment, a measure of government spending on infrastructure, rose 23.8 percent year-on-year. Retail sales, a key indicator of consumer spending, rose 18.1 percent year-on-year in December 2011, up from the 17.3-percent growth seen in November. "The figures are very impressive amid complicated international and domestic situations," Ma said. Ma's comments were echoed by Zhang Xiaojing, a researcher with the Chinese Academy of Social Sciences, a government think tank. Zhang said the slowdown was a result of macroeconomic controls and sluggish external demand. "Since the country's inflation has eased, the government has more room to fine-tune its macroeconomic policies in the future. Authorities could continue to implement structural tax reduction to change the country's economic structure and improve livelihoods," said Zhang. A December inflation decrease has fueled widespread guesses about possible policy loosening to spur the slowing economy, although analysts believe that significant easing is unlikely, since inflationary pressures still remain. The full-year inflation figure for 2011 was still up 5.4 percent from the previous year and well above the government's full-year control target of 4 percent, according to the NBS. The People's Bank of China lowered banks' reserve requirement ratio (RRR) by 50 basis points in December, its first cut in nearly three years. The country's central bank will cut the RRR before the Spring Festival holiday and make another two cuts in the first half of the year in an effort to ease the credit crunch among Chinese firms, said Liu Ligang, director of the economic research department of ANZ Greater China. "The government should consider the long-term, as structural adjustment will be an arduous task. It's vital to boost investment by non-property companies and raise people's incomes. Income distribution reform will not be easy, but it is a must for China's future growth," said Yuan Gangming, a researcher with Tsinghua University. China's fixed-asset investment rose 23.8 percent year-on-year to 30.1933 trillion yuan ($4.7736 trillion) in 2011, the National Bureau of Statistics (NBS) said on Tuesday. The growth rate was down 0.7 percentage points compared to that in the first 11 months, and remained flat from that of last year, NBS figures showed. On a monthly basis, fixed-asset investments fell 0.14 percent in December, the NBS said. In 2011, investment in the primary industry amounted to 679.2 billion yuan, up 25 percent; that in the secondary industry totaled 13.2263 trillion yuan, up 27.3 percent; investment in the tertiary industry rose 21.1 percent to hit 16.2877 trillion yuan. Investment made by the state-owned and state-controlled enterprises increased 11.1 percent year-on-year to hit 10.7486 trillion yuan last year. Infrastructure investment, excluding investments in the production and supply of power, gas and water, rose 5.9 percent year-on-year to 5.106 trillion yuan. But the rise was 14.3 percentage points lower than that of last year. Investment in the nation's western regions grew fastest last year, up 29.2 percent year-on-year, followed by 28.8 percent in the central regions, and 21.3 percent in the eastern regions. Meanwhile, investment in the nation's property sector rose 27.9 percent year-on-year to 6.174 trillion yuan, down 4.1 percentage points from that in the first three quarters and 5.3 percentage points from last year.